​When hundreds of different types of chairs are available to choose from, style becomes an important factor in your gaming chair. And the Giantex Executive Swivel Gaming Chair High Back Sports Racing Style Ergonomic Adjustable Chair absolutely has style. Clearly defined edges, quality piping, clever color palettes, and an interesting ergonomic profile help define this chair and set it apart from the sea of copy/pasted gaming chairs. I personally love how refreshing this chair looks. I’ve spent quite a bit of my time relaxing in it and I can say, with confidence, that this chair doesn’t hedge all its bets on its looks alone. The comfort profile is somewhat unique, as it looks like very much an open-backed office chair in form, but once you settle into it, it feels like more of a snug and cozy gaming chair. Gaming in a chair like Giantex helps you to imagine yourself behind the wheel of a slick car or handling the controls on a mission. 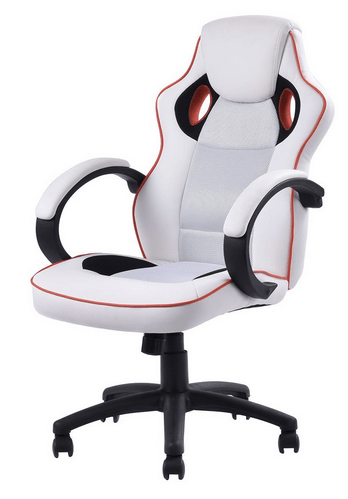 This Giantex masterpiece has an elegant white PU leather and mesh exterior that sets it apart from the usual black seen on a majority of computer chairs. It’s stand-apart look is enhanced by the rounded armrests and red detailing. And there’s an appealing simplicity in the lack of unnecessary features. There’s no way this Giantex product can go unnoticed in your office or game room. If you’re an aspiring video game streamer who’s just starting out and wants to find a budget chair, then you’ve got a pretty good option in this Giantex. This chair is something that will help accentuate your charisma without making much of a dent in your wallet. Not only is it incredibly good looking, but it also manages to be good looking without being obnoxious. The comfort is also incredibly well suited to long hours of streaming. Unfortunately, we do find ourselves missing the extra adjustment options and functionality of the more expensive gaming chairs. But we still think that this is quite a good trade off at such a low price. You get great comfort and visuals, along with a good deal on the price. The colors make this Giantex computer chair a luxurious choice for an executive office or conference room too. Black blends in. It’s expected. White and red are a bold choice that will make you feel in charge. And the comfortable sponge-filled seat and backrest conform to your body, an important feature for long work days or hours of gaming in your free time. The Giantex gaming chair is not the most feature-filled chair we have reviewed here, but for a gamer, with simple needs, you can’t beat the price. It seems like Giantex chair reads reviews on their competition as they solved the major complaint from gamers about armrests. These are nicely padded and very comfortable. You can lay your arms down in comfort for hours without them getting sore. Here are the features you can expect when you purchase a Giantex gaming chair for your computer room. The seat dimensions for the Giantex chair come in at 20.5" X 19.5", and the backrest dimensions are 21" X 26.8". These dimensions make the chair roomy, but it may not provide adequate support for taller gamers. Also, the simple design keeps this chair light. It only weighs 37.4 pounds, making it easy to bring inside once the shipment arrives. ​What are the features we found most useful? We’ve inspected dozens of gaming chairs, including racing style chairs like this one, at gamingchairs.com. Here are the top benefits to the Giantex gaming chair. ​​And to provide a balanced review so that you can make the right game chair decision, here are the things we’re not so crazy about. It’s really up to you whether replacement parts are a big deal. If you’re looking to change the casters for a different kind, you can get those through other companies and you can find varieties that fit this chair. What everyone wants to know about the Giantex chair. The pros and cons listed above give a pretty good indication of whether this is the right chair for you. But you probably have more questions before you decide which game chair to spend your money on. We totally understand, and that’s why we’ve gathered up the answers to frequently asked questions about this Giantex chair. What shade of red is the striped detailing on the chair? Computer monitors and other device screens don’t always show color exactly the same as it looks in person. The red is a cool, deep shade. We’d say it’s a dark red. Be aware that the color schemes can change over time as the models are updated. Newer ones might be different shades. Is the chair back high enough for taller people? The back is 26.8 inches high, which makes it a bit shorter than the backrest on several other racing style chairs, like the Homall Executive Swivel Leather Gaming Chair. Many taller testers found the chair comfortable, but it may not provide the support a tall person needs for long gaming or work sessions. The seat height is adjustable, so if it feels uncomfortable at first, it may just need to be moved up for taller gamers. Is the chair hard to put together? Not at all! In fact, this is one of the easiest chairs we’ve found to put together. That’s another reason why it’s especially good for young gamers. You can get it together in less than half an hour with basic tools. The backrest is on the heavy side, so if you have trouble lifting and placing it on the base then you may need a hand to get it on there right. That said, it should take less than 5 minutes to put it together. The backrest tilts back and has a rocking function, so you can relax between tasks. Is this chair easy to move on the carpet? The casters are of somewhat cheap construction. They don’t move especially well on carpeted floors, especially if it’s thick carpeting. That being said, you can purchase different casters if you really like the chair and want to improve its mobility. The best casters in our opinion are the PU rollerblade style casters that glide easily over any surface and make no noise at all. 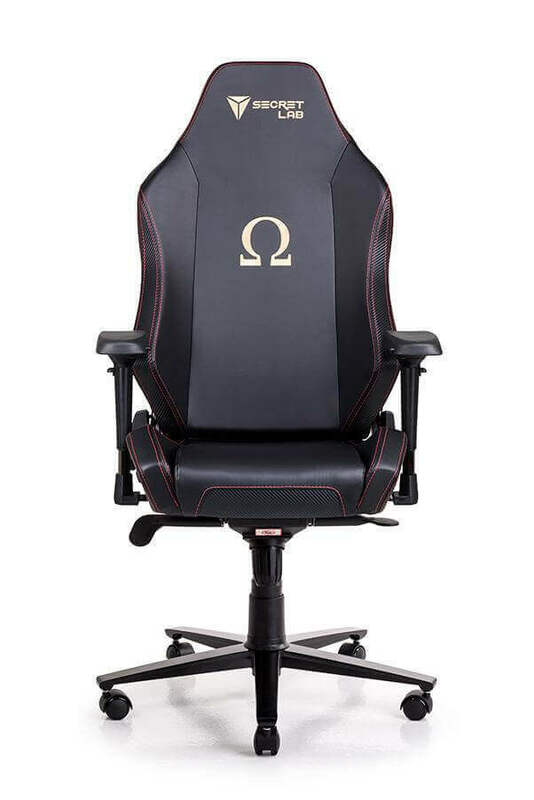 Is this chair good for heavy gamers? We do not suggest this chair for larger gamers. There are plenty of game chair options that are sturdier and more comfortable for individuals who need more support. However, this Giantex piece is excellent for teens and young adult gamers, particularly those with a limited budget. The weight capacity is 264 pounds. You may be able to go a bit beyond that, but if you are straining the chair, then it will break down over time. If you are bigger than that you may want to look into a chair designed especially for big and tall gamers. Sometimes it’s hard to make a decision without a few other options to weigh a product against. Two racing style gaming chairs that come close to the Giantex executive computer chair in price and features are the Merax Ergonomic Racing Style PU Leather Gaming Chair for Home and Office and the Devoko Gaming Chair Racing Style Bucket Seat Premium PU Leather Chair Swivel Executive Office Chair Lumbar Support Desk Chair. Of the three, the Giantex gaming chair has the lowest cost and simplest design. Like the Giantex gaming chair, the Merax Ergonomic Racing Style Gaming Chair has non-adjustable armrests that connect to the seat and backrest. They are also similar in style, except that the Giantex chair’s armrests have a more rounded shape, and the Merax chair’s armrests have angles. And, as we have already mentioned, the Giantex has a nice, thick cushion for the armrests. Both chairs have plastic casters to allow the chair to roll on floors, and they each feature adjustable heights. The Merax chair, however, has a slightly lower weight capacity, at 220 pounds. One of the main differences between the two is that the Merax gaming chair has a lockable reclining feature so you can lay back in the chair. The Merax chair also comes in a variety of color choices. But we think the Giantex chair still has the most style. The Devoko gaming chair shares many of the same features, including plastic casters and non-adjustable armrests. It also reclines and locks in place, like the Merax chair. However, unlike either the Giantex office chair or the Merax office chair, the Devoko computer chair has an amazing load capacity of up to 330 pounds. And the company offers free replacement for damaged or defective parts, which sets Devoko apart from many gaming chair companies. It really depends which features are the most important to you. Each of these chairs has different pros and cons from each other. If you’re looking for a minimalist racing chair without complicated features or setup, then Giantex is a great chair for simple gaming, working, or studying needs. We highly suggest this chair for teens and young adults for their bedroom, office, computer room, or game room. It’s one of our top picks for best-looking gaming chairs. For a first step into the world of racing chairs, the Giantex racing style gaming chair is a safe bet for an inexpensive chair that will last for several years.